If you have any questions about the STAR SHIP information page below please contact us. 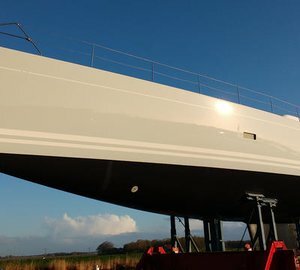 The motor yacht STAR SHIP is a 44 m 143 (foot) generous aluminium boat which was made by Van Mill and concieved by Pieter Beeldsnijder Design and Murray & Associates. Accommodating 10 guests and 9 crew members, motor yacht STAR SHIP is ex Luisamar V; Le Soleil Ii; Almaviva. 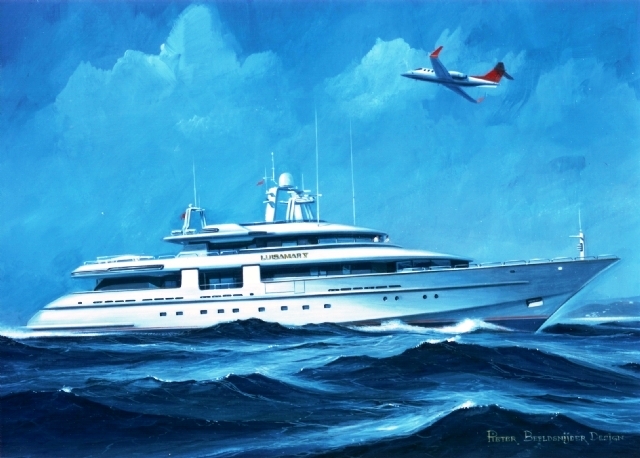 The gracious motor yacht was envisaged with a naval architect called Pieter Beeldsnijder Design and Murray & Associates. Procasa/De Merwede/Claudette Bonville (Refit) was involved in the designing of the interior. Pieter Beeldsnijder Design was the naval architecture company involved in the formal vessel plans for STAR SHIP. 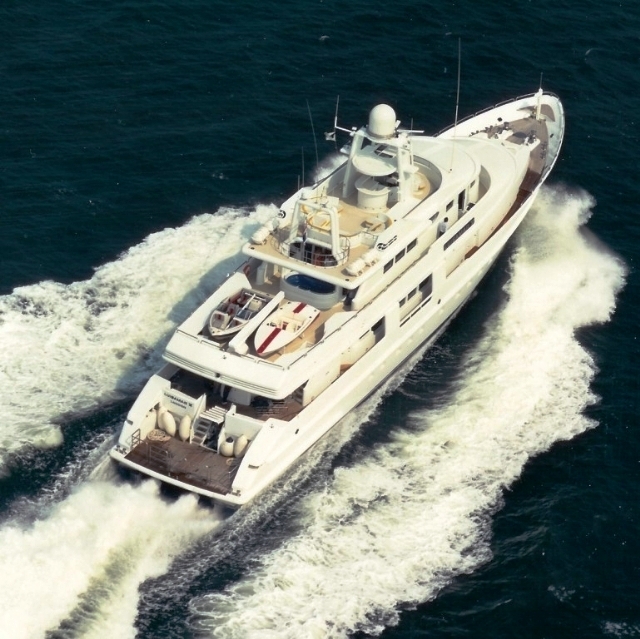 Her interior design was completed by Procasa/De Merwede/Claudette Bonville (Refit). Pieter Beeldsnijder Design and Murray & Associates is also associated with the yacht general design work for this yacht. Created at Van Mill the vessel was built in the recognised yachting country the Netherlands. She was successfully launched in Hardinxveld-Giessendam in 1988 before being transferred to the owner. The hull was built out of aluminium. The motor yacht superstructure is made extensively using aluminium. With a width of 8.23 metres or 27 ft STAR SHIP has fairly large size. A reasonably shallow draught of 2.13m (7ft) determines the number of certain marinas she can enter, taking into account their individual characteristics. She had refit improvement and modification carried out in 2007. Powered by twin CATERPILLAR diesel engines, STAR SHIP is able to attain a high speed of 20 knots. STAR SHIP is propelled by twin water jets (kamewa). She also has an economical range of 3000 nautical miles when motoring at her cruising speed of 16 knots. Her total HP is 5040 HP and her total Kilowatts are 3709. As for the yacht’s stabalisers she was built with Quantum Zero Speed At Anchor. The generous luxury yacht motor yacht STAR SHIP is able to accommodate a total of 10 guests in addition to 9 professional crew. 43.6 metres / 143 feet. Giving the combined power of 5040 HP /3709 KW. Quantum Zero Speed At Anchor. As the yacht boasts a landing area for helicopters onboard, STAR SHIP is able to transport people and equipment to and from another remote area. The yacht uses Heinen & Hopman air con. She has a teak deck. The luxury yacht STAR SHIP displayed on this page is merely informational and she is not necessarily available for yacht charter or for sale, nor is she represented or marketed in anyway by CharterWorld. This web page and the superyacht information contained herein is not contractual. All yacht specifications and informations are displayed in good faith but CharterWorld does not warrant or assume any legal liability or responsibility for the current accuracy, completeness, validity, or usefulness of any superyacht information and/or images displayed. All boat information is subject to change without prior notice and may not be current.